Neural Networks have the following features. They are inspired by nature. The human mental capabilities are generated by the brain, which can be viewed as a large set of neurons (1010 to 1011 many), each connected to around 103 to 104 many others. Unlike to expert systems or decision trees neural nets do not make use of an explicit symbolic representation. Each individual neuron behaves in a very simple way. A neuron receives inputs from other neurons, x1,x2,... ,xn, which are weighted by weights w1,w2,... ,wn. If yes, it sends out the value 1 (excitatory). If not, it sends out the value -1 (inhibitory). a set of weights (for each link one). In the simple case, which we will consider in the following, the set of input neurons, the set of output neurons, and the set of hidden neurons are given. Furthermore the topology is given, that is, the programmer has fixed initially which neuron is connected to which others. The weights have to be learned. If the desired output and the actual output values are equal, do nothing. If the actual output is -1, but should be 1, increase the weights, that is, wi -> wi+delta wi with delta wi = lambda* (di-Oi)xi. If the actual output is 1, but should be -1, decrease the weights, that is, wi -> wi+delta wi with delta wi = lambda* (di-Oi)xi. We want to find a way to separate the positive from the negative examples. Assume initial (guessed) weights as [0.75,0.5,-0.6]. 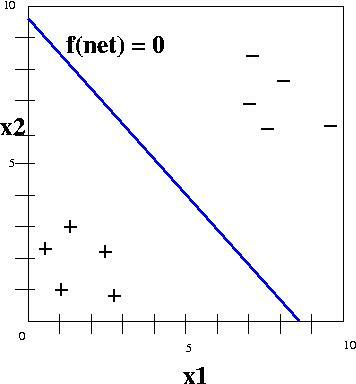 f(net)2=f(0.75* 9.4 + 0.5* 6.4- 0.6* 1) = 1, however the result should be -1, so we have to apply the learning rule, i.e., wi-> wi+lambda*(d-sign(wi* xi))xi, that is, w1-> 0.75 +0.2*(-1-1)* 9.4=-3.01, likewise w2=-2.06 and w3=-1.00. This will be repeated for all input values and we will get the final weights satisfying 1.3* x1 +1.1* x2-10.9=0 See [Luger, p. 424ff]. The choice of the learning rate lambda should not be too big (you will miss the true value), or too small (learning will be very slow). It is usual to decrease the learning rate slowly over time. 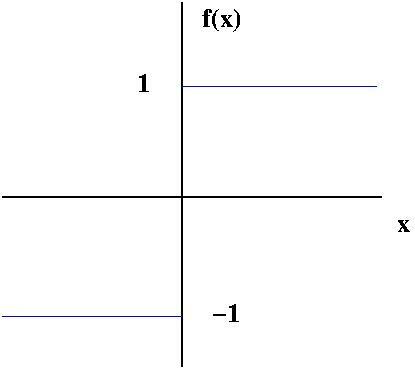 All that can be learned is a straight line to separate positive from negative examples. But what, if the positive and negative examples cannot be separated by a straight line? Use more sophisticated threshold functions. First the weighted inputs are summed up: net=sumi=1nwi* xi. Can approximate hard-limiting threshold function well for large lambda. In order to overcome the limitations of the perceptron, create more complicated networks. 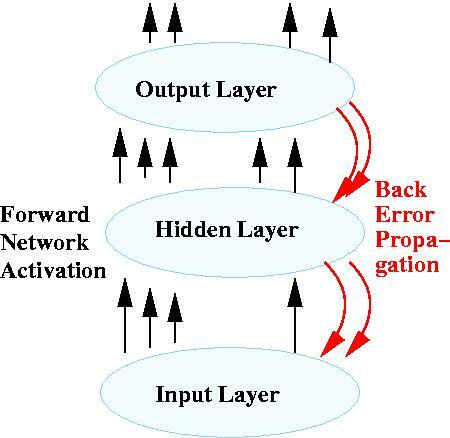 The perceptron can be viewed as a network of two layers, the input layer and the output layer. Any node, which is neither an input nor an output node, is called a hidden node. It is possible to create networks with many hidden nodes. A standard approach is to have a layered approach, in which all nodes are partitioned in layers and each layer n feeds in the next layer n+1 only. A simple, but already very powerful topology of nets is the three layered topology, in which there is one input layer, one hidden layer, and one output layer. All input nodes are connected with all nodes in the hidden layer. All nodes in the hidden layer are connected with the output layer. No further nodes are connected. Since the number of input and output nodes is often determined by the problem to be solved, the only decision a designer has to make is to determine how many hidden nodes the net should have. The weights have then to be determined in a so-called training phase of the net. T is the set of training examples (given in form of an input list and an output list). Take a training example x and compute the corresponding outputs. 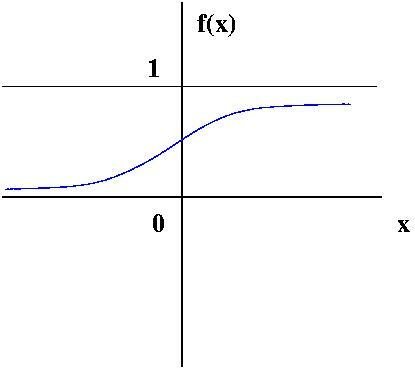 The change of weights to the output nodes should be proportional to the difference between desired and actual output dk-Ok, multiplied with the derivative of the sigmoid function. The value for a hidden node is updated similarly. However, since there is no error value which directly tells how to update it, the weighted average of its contribution to the errors is taken, where wk,h is the weight between the hidden node h and the output node k.
Let a list of attribute values [a1,a2,... ,an] be given, e.g., [Outlook=sunny, Humidity=high, Wind=strong] . The task is to predict a target concept PlayTennis in form of a yes/no decision. Approach: Estimate probabilities of P(vj) and P(ai|vj) from the frequencies in the training set. Naively assume that the probabilities are all independent, i.e., we can compute P(a1,a2,... ,an| vj) as the product P(a1|vj)* P(a2|vj)*...* P(an|vj). new Sunny Cool High Strong ??? Thus Naive Bayes chooses the attribute with the higher probability, i.e., No in this case. Assume we want to learn the target concept C, e.g. C= "www page that discuss the topic `Artificial Intelligence'." Assume we have k examples, e.g., pages of which we know for each whether it is relevant or not. We collect all n different words in all pages, e.g., n=1,000,000 words, w1,w2,... ,wn and estimate their probabilities (from the training data): P(AIRelevant = Yes), P(AIRelevant = No), P(wi = Yes | AIRelevant = Yes), P(wi = No | AIRelevant = Yes), P(wi = Yes | AIRelevant = No), P(wi = No | AIRelevant = No), ... .
Classify according to greater probability. Neural Networks and the Naive Bayes approach can be used in areas in which humans have no good intuition and do not know any causal relationship. The methods do not give any explanation for their answers. In some domains Naive Bayes has a comparable performance to decision tree learning and neural nets. George F. Luger. Artificial Intelligence - Structures and Strategies for Complex Problem Solving. 4th Edition, Addison Wesley, 2002, Chapter 10. Tom M. Mitchell. Machine Learning. McGraw-Hill, 1997, Chapters 4 and 6. S. Russell, P. Norvig. Artificial Intelligence - A Modern Approach. 2nd Edition, Pearson Education, 2003. Chapter 20. Many more general AI texts and specialised books and articles. Specialised lecture on Neural Nets. The URL of this page is http://www.cs.bham.ac.uk/~mmk/Teaching/AI/Teaching/AI/l4.html.